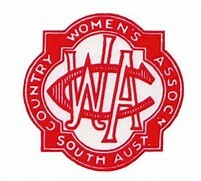 The South Australian Country Women’s Association has been serving the community since 1929. We are not for profit, non-party political and non-sectarian. The organisation is made up of volunteers who work to promote the welfare and conditions of life for women and children, of all ages, whether in the city or country. Our slogan is ‘Sharing and Caring with Action’. Sharing involves service and the giving of time, talents, efforts and finance. What is given in service is the road to what is gained personally. Caring involves friendship, tolerance and understanding of others. The provision of welfare is important to us and by working together much can be achieved. Social issues need constant monitoring and lobbying at local, state and federal levels. We also believe that education is continuous, heritage skills and history are worth preserving and leisure activities enhance the quality of life.